Repinly helps you find the most popular pins, boards, and pinners on Pinterest. Why is this helpful? So that you can see what the community at large is most interested in and what is working for other pinners. This is a great tool to help you get better acclimated to this still mostly craft and DIY network as well as help you discover the type of content that's trending right now. 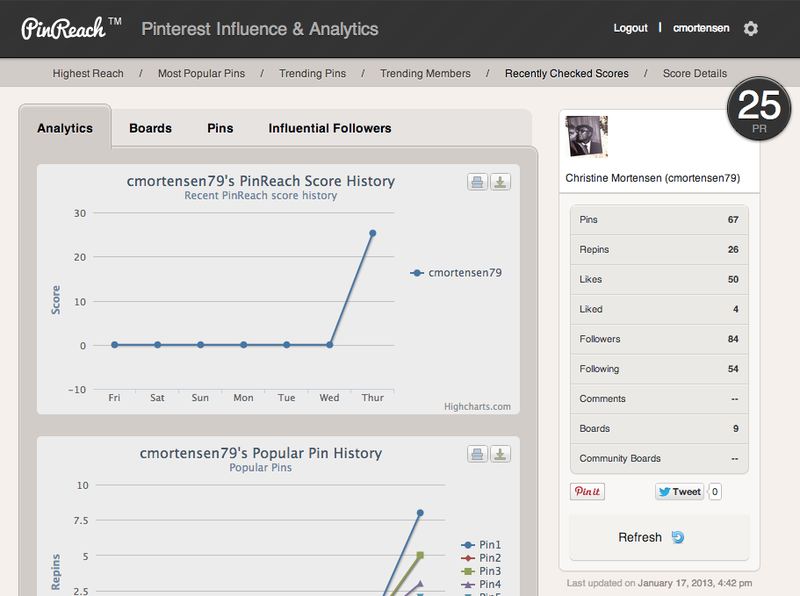 Pinpuff, often called the Klout for Pinterest, is a free tool that measures your virality on Pinterest. It calculates a "pinfluence" score according to your popularity, influence, activity, and reach from a scale of 0 to 100. From Pinpuff, "We aim to help Pinterest users to keep a track of their Pinning activities on daily basis and suggest them possible tips/measures to get maximum out of Pinterest." For businesses, this is a great tool to keep a general eye on influence changes. But like any other influence measurement tool you have to weigh the information they give you with your own knowledge of your audience. And that's the one thing that algorithms will never be able to replace... you. Also of note is that Pinpuff was acquired by Science in June of 2012. The graphic below shows what they consider a "good" score. In addition to measuring your Pinterest influence and comparing your most popular boards and pins, PinReach curates content and profiles to inspire you. From Pinreach themselves, "We build tools to help you understand activity, measure impact, gauge success." This is by far my favorite Pinterest tool. They really have a marketers perspective in mind. I want to know what are my most popular boards, pins, etc. I do, however, wish it would tell you how many followers you have per board. Right now it reports that each board has the total number of followers who are following you (e.g., it says that for each board I have 84 followers when that is my total number of followers). Overall, these three are simply pintastic tools (sorry, it's just so easy to go there with Pinterest). Now... I'm just waiting to see which gets bought by Pinterest first. Any bets?